BTS fans, rejoice!!! 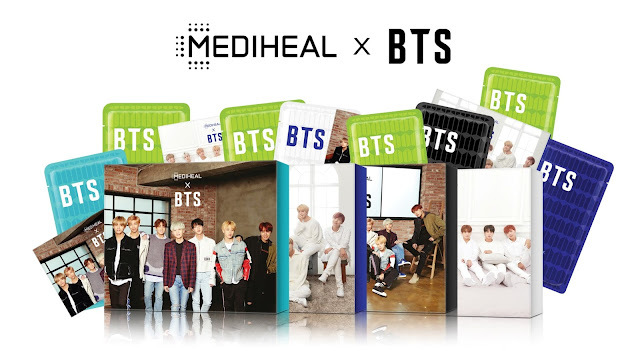 MEDIHEAL x BTS Boxed Set, which includes 10 mask packs and 14 photo cards, IS NOW available online at www.watsons.com.ph! You may also get these boxed sets at SM Makati Activity Center until supplies last. BTS, the seven-member K-Pop group composed of RM, Jin, Suga, J-Hope, V, Jimin and Jungkook, was the most talked-about artist on Twitter in 2017. Their hectic schedules and frequent plane rides make for tired and dehydrated skin, which is why they turn to Mediheal for skincare solutions. Contains ingredients that help moisturize the skin and help improve its elasticity. BTS as a whole has a stockpile of this in their dorms for a quick fix whenever they need it! Soothes sensitive skin and manages enlarged pores. This is JungKook and J-Hope's favorite. Soothes and hydrates sensitive skin. This is Jimin and Jin's favorite. Improves skin moisture retention as well as making it brighter. Makes dehydrated skin dewy. This is Suga and V's pick. Delivers hydration to tired skin to revitalize it. This is RM's pick to prep it for makeup, especially during the winter. www.watsons.com.ph will have all four boxes of MEDIHEAL x BTS—Hydrating Care, Brightening Care, Moisturizing Care and Soothing Care. Each box will retail for Php 1,250, which is considered a steal considering that the mask sheets usually retail for Php149 each, and that this is a special box with a photoset included.